Back again for day 2 of the Gaming Life Expo to see pro poker players. Click on the thumbnails to see a bigger version of the picture. First picture is of Guns Hansen signing autographs. It’s amazing how poker players are treated like real celebrities at the WSOP. The next set shows the Seamless Gentlemen’s Club’s dunk booth, one of 3 real dancers who work there looking scared about getting dunked into the water. A few seconds after this picture, she goes int0 the cold and murky water. Mark Seif was at the PPT booth. The next picture is a booth for a Xbox 360 WSOP game. There didn’t seem to be too much interest. I think the people at the Expo want to see live people. 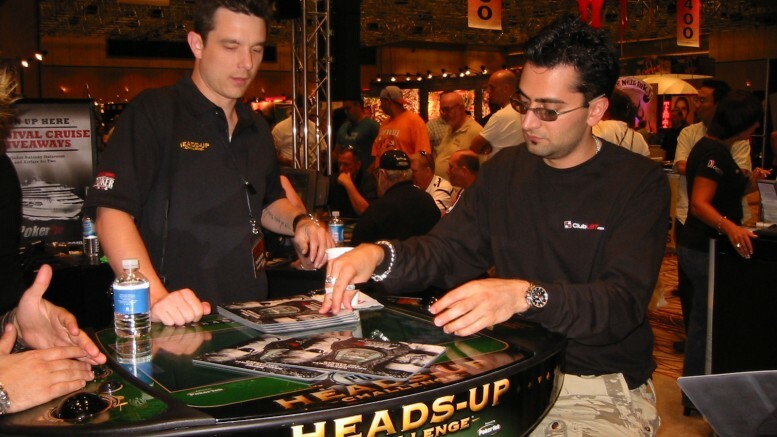 Antonio “The Magician” Esfandiari playing on a heads-up computerized poker table against Phil Gordon. Next pictures is of 10 time WSOP bracelet winner Johnny Chan signing autographs. During his break from one booth, he went over to yet another booth for more signing. There was a long line at both booths. Here at the WSOP, the poker pros are treated like big time celebrities. Phil Gordon playing against Phil Laak on a heads-up computerized poker table. I read Phil’s “Green Book” that my friend Deana gave me. Good info and a quick read. Antonio “The Magician” Esfandiari signing autographs. I don’t know him, but he didn’t seem to want to be there all that much. Maybe that’s the way he always is. He did comply with all the stupid requests from people. One guy wanted his picture taken with Antonio holding 7-2 offsuit and the guy holding pocket aces. One of the few hot ladies of poker, Vanessa Rousso signing autographs at a booth. She’s also super smart and graduated from Duke in only 2 and a half years and I think just finished law school, according to her myspace page. How does she finish law school and play pro poker, and do promotions? I have no idea. She’s dating Chad “Downtown” Brown, a fellow poker player and commentator. She’s done pretty well for herself. One of the Pro Player Drinks girls poses for me, only after I agreed to taste the drink. It tastes like orange soda. Hmmm. Energy drink specifically marketed only to poker players. I don’t think so. Nice try though. “Real” celebrity Jennifer Tilly and boyfriend and poker player Phil “Unabomber” Laak shown playing on one of the computerized poker tables. Phil gets knocked out first with AQ. Olympic Garden girls posing on their booth’s stage. Nice shot, right? Hall of Famer, “Amerillo Slim” Preston in the halls. Not sure if he was playing or promoting something but he joked that I could use this picture like a scare scrow to get rid of birds. Chris “Jesus” Ferguson giving an interview in the halls. He was wearing a Matrix type black trench coat. Last shot is Daniel Negreanu taking pictures with a fan. On a side note not related with the Expo, I was playing a live game at the MGM and met Ron, the president of Lightning Poker which has a booth at the Expo. They also make those computerized tables and Ron told me that they will have a few of their units at the Commerce Casino in Los Angeles. I really think these computerized tables will become the norm in the future. Old timers won’t like it but the online 20 something players are going to love it. The casinos save money by not having to have chips, dealers, or cards. Players won’t have to tip the dealer or deal with mistakes, or people playing out of turn. But for now, the units might be too expensive, even though they are leasing them to the casinos. When the price goes down, this will be the future of live poker playing. Be the first to comment on "Gaming Life Expo 2007 – Part 2"